The What: Peerless-AV has launched its new indoor Portrait Kiosk for displays ranging from 40–55 inches. 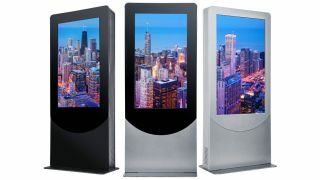 The What Else: The newest addition to Peerless-AV’s line of kiosk solutions, the floor-standing, indoor Portrait Kiosk supports the latest displays and touchscreen panels from the industry’s leading manufacturers. Features include a flat base (freestanding or bolted to the ground) for easy access to electric and data cables; two whisper-quiet, thermostat-controlled exhaust fans for maintaining an optimal internal temperature; lift off, bi-level rear doors for direct access to parts requiring maintenance; internal tray for organization of media players and cables; and keyed-alike cam lock for theft protection. The new Portrait Kiosk is available as a standard solution for Peerless-AV’s customers. Enhanced options that can be added to the kiosk include stereo speakers and amplifiers, high definition web cameras, bar code scanners, credit card readers, Wi-Fi or cellular connectivity with an external antenna, proximity sensors, and thermal receipt printers. For applications where branding compliance is required, further custom options include bespoke color finishes, vinyl logos, and wraps. The Bottom Line: Featuring a curved design, the new Portrait Kiosk offers a range of functions, such as wayfinding, entertainment, and digital merchandising, for any indoor application setting from corporate to retail, to hospitality, and beyond.